NASA's Mars rover Curiosity photographed this odd object on Aug. 13, 2018. 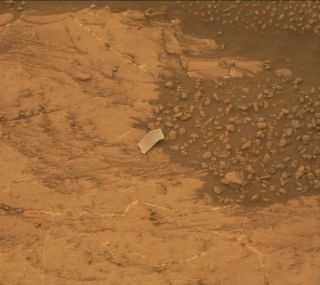 Mission team members initially thought it might be a piece of the rover, but Curiosity's observations revealed it to be a rock flake. Don't worry: NASA's Mars rover Curiosity isn't falling apart. "In fact, it was found to be a very thin flake of rock, so we can all rest easy tonight — Curiosity has not begun to shed its skin!" mission team member Brittney Cooper, an atmospheric scientist based at York University in Toronto, wrote in an update Thursday (Aug. 16). "Perhaps the target should have been given a different name befitting the theme of the current quadrangle in which Curiosity resides: 'Rabhadh Ceàrr,' or 'False Alarm' in Scottish Gaelic," she added. Curiosity recently drilled a Pettegrove Point rock dubbed Stoer, and the rover has begun analyzing the snagged samples, Cooper wrote in the update. The 1-ton rover has also been measuring the opacity of the Martian atmosphere of late, helping researchers monitor the global dust storm that has been raging on the Red Planet for the past two months. The storm has begun dying down, but there's still apparently so much dust in the air that Curiosity's older, smaller, solar-powered cousin, Opportunity, cannot harvest enough sunlight to recharge its batteries. Opportunity has been silent since June 10, and NASA officials think the long-lived robot put itself in a sort of hibernation. Curiosity is nuclear powered, so it's not terribly bothered by dust storms and darkness. The $2.5 billion Curiosity mission, known formally as the Mars Science Laboratory, launched in November 2011 and landed inside the Red Planet's 96-mile-wide (154 kilometers) Gale Crater in August 2012. Curiosity was tasked with determining if Gale has ever been capable of supporting microbial life. The rover quickly answered that question, finding that the crater's floor hosted a long-lasting lake-and-stream system billions of years ago. Since September 2014, the rover has been exploring the foothills of Mount Sharp, the 3.4-mile-high (5.5 km) massif that rises from Gale's Center. Curiosity is reading the rock layers as it climbs, hunting for clues about when and why Mars shifted from a relatively warm world to the frigid desert it is today.